Will your child be 4 in 2019? Please take a look at our Newsletter to see what is happening around campus so far this year! We have received our accreditation from AdvancED! On the last day before the Easter holiday, students and faculty participated in our annual Easter Retreat Day. We began with a very special prayer service reenacting Jesus washing the feet of His disciples. Eleven students and one teacher represented the twelve disciples. It was a humbling and prayerful experience that brought many emotions to the surface for all involved. We were thankful to have the parents who joined us as well as Father Mike who gave us a wonderful homily. We then had a morning filled with Easter egg hunts, Stations of the Cross, holiday videos, song, and even dance with our little ones! 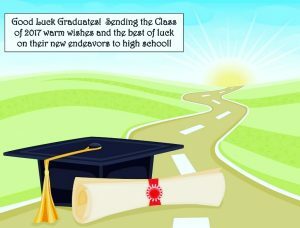 As we begin the homestretch of the school year, we are ready for the good weather and the activities that brings, as well as focusing on our school work with the goal of ending the school year on a high note. We are celebrating our amazing office staff on Administrative Professional Day as well as our dedicated and loving school nurse on Nurse’s Day. Some of our students will be receiving the sacrament of Confirmation or Communion over the next few weeks and we pray that their hearts, minds, and souls are ready for these very special sacraments. May God bless them – now and always! Surprise visit from our local NYC fire department, Ladder Company 170! 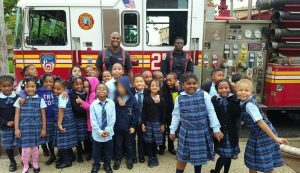 On October 4th, Our Lady of Trust Catholic Academy got ready for fire prevention week 2016 with a surprise visit from our local NYC fire department, Ladder Company 170. Our younger students, from Pre K-3 through grade 2 were lucky enough to experience up close the special work our FDNY members do on a daily basis. Each of these classes had the opportunity to join our local heroes on the fire trucks, observe the inside of the trucks, see the equipment first hand, sit in the ‘driver’s seat’, and even hold and use the fire hose! Ladder Company 170 was so generous to share their time with us. I believe that our children will hold on to this memory for the rest of their lives. We are truly thankful! It was an amazing experience for everyone! The 2016-2017 School Year is quickly approaching! We would like to remind everyone that the first day of school for K through 8th is Wednesday September 7th. Dismissal for September 7th through September 9th will be 12:00PM, and Monday September 12th we will begin full days of school. Our Pre-K 3 & Pre-K 4 classes will have orientation on Thursday September 8th from 9:00AM to 10:00AM for both parents and students. The children will return the following day, Friday September 9th at 8:30AM on their own for the first time, with an 11:40AM dismissal. They will also begin full days on Monday September 12th. Our Parent Orientation for Grades K through 8 will be on Tuesday September 13th at 6:30PM. Please call the office if you have any questions! See you all soon! !